If a person could travel eternally through space and time, how would this power affect them, psychologically and emotionally? In a fun and accessible way, Doctor Who Psychology explores this question through an analysis of the longest-running sci-fi TV series of all time. 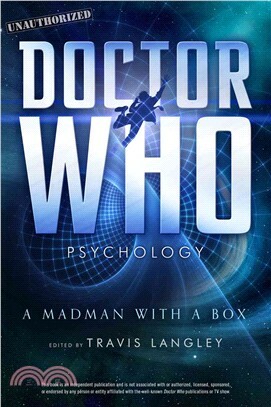 This fascinating in-depth academic study, edited by Travis Langley, contains 20 essays delving into the psychology behind the time-traveling Doctor in his many iterations, as well as his companions and his foes. Travis Langley is a psychology professor at Henderson State University, the author of?Batman and Psychology? (Wiley), and the volume editor of?The Walking Dead Psychology?and?Star Wars Psychology? (both Sterling). He speaks regularly on media and heroism at universities, conferences, and pop culture conventions including San Diego Comic-Con, New York Comic Con, and Wizard World conventions throughout the world. ?Necessary Evil: Super-Villains of DC Comics?and other films have featured him as an expert interviewee, and the documentary?Legends of the Knight?spotlighted how he uses fiction to teach real psychology. Psychology Today?carries his blog “Beyond Heroes and Villains,” and he is one of the 10 most popular psychologists on Twitter with over 100,000 followers: @superherologist.